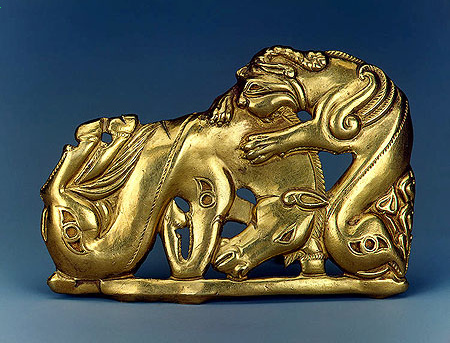 An Amsterdam court has decided to give the disputed collection of Scythian gold to Ukraine, not to Crimea where it was kept before. The collection consists of artifacts from four Crimean museums. It was kept at the Landes Museum, the Rhineland regional-history museum in Bonn, Germany, when the Crimea voted to secede from Ukraine. After that, for two years Amsterdam had not been returning the collection to these Crimean museums, which provided these historical jewels. Now Crimea museums have three months to appeal the decision, but it is obvious that the chance of returning property is very small. The Hague stressed that only sovereign states could apply for cultural heritage, and the Crimea was not that one. However, Pavlo Klimkin, Ambassador Extraordinary and Plenipotentiary of Ukraine called the Dutch court’s decision as “a great victory”, there were some interesting facts. First of all, Kiev has to pay to the Netherlands, which more recently said that Ukraine would not receive any of the country's financial, military or other assistance, 300,000 euros for the storage of this collection. Secondly, just in a month the inauguration of Trump will take place in the United States, and there is a chance for the worldwide recognition of Crimea as a part of Russia. Then the Crimean museums would have the same legal status as Kiev, with a three-month period for filing appeals may be still valid. In such a scenario, the decision of the court could be considered not as “a great victory”, but rather a kick to the Ukrainian authorities.